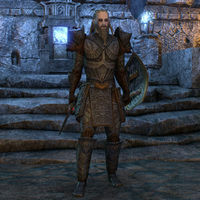 The Nedes (also known as the Nedic peoples) were a human race of unknown extraction, who inhabited much of Tamriel during the Merethic and First Eras. Their society largely revolved around the study of the constellations, and worship of beings known as the Celestials. Nedic culture experienced a sharp decline over several centuries as they began to assimilate into other cultures, before being completely exterminated by the Yokudan invasion of the Deathlands. This page was last modified on 7 January 2016, at 16:47.